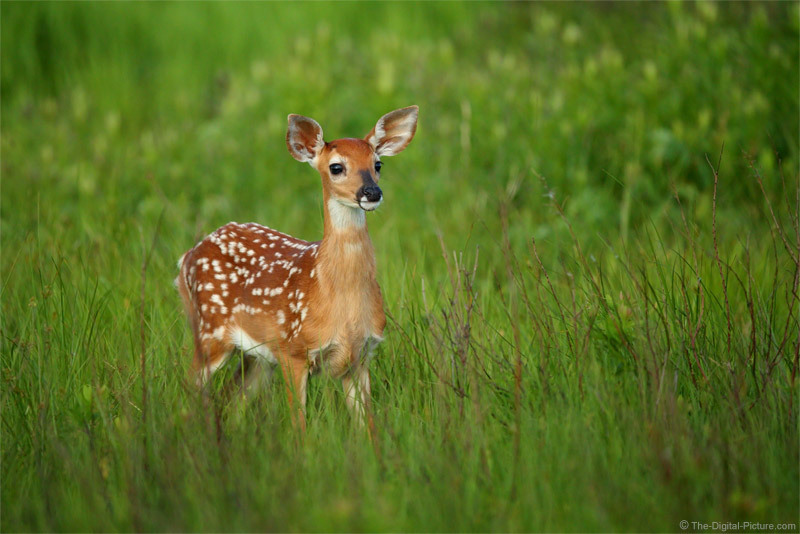 Whitetail fawns are cute and curious – and they are bundles of energy (when not sleeping). This one abruptly stopped after leaping around, intently watching something of interest. Alert poses are one of my favorites for wildlife with the ear position usually being ideal. From a compositional standpoint, the direction of the gaze adds weight to the side of the frame being gazed toward. That means this fawn works well being positioned toward the left side of the frame to provide overall balance. Of course, the beautiful SNP spring green landscape nicely compliments the colors of the fawn. Fawn photography at this location can make use of all available telephoto focal lengths, from short telephoto to the longest super telephoto focal lengths available. The flexibility offered by a zoom lens has its advantages and, in this case, the Canon EF 200-400mm f/4L IS USM Lens' built-in 1.4x extender was especially helpful. I have a unique, limited opportunity for you: I'd love for you to join me for "Whitetail Fawns and More", a Shenandoah National Park Instructional Photo Tour. Our goal is to photograph these beautiful little creatures along with many of the other great subjects found in Shenandoah National Park while actively learning photography skills. Read the just-linked-to detailed description to learn more.